While Attending the Third National ACO Summit in Washington, DC last week I had the opportunity to cross paths with Thomas Merrill my liaison with Leavitt Partners (LP) responsible for our interview on ‘This Week in Accountable Care‘ discussing LP’s initial release of their report ‘Growth and Dispersion of Accountable Care Organizations.’ Thomas informed me of an impending update to their landmark issue in November 2011. That update is now available via the Leavitt Partners website here. The last eight months have seen considerable growth in the number of health care entities commencing accountable care payment arrangements. Despite large variation in models used, this growth is evidence of the increasingly common belief that health care should be more than simply providing and billing for services. 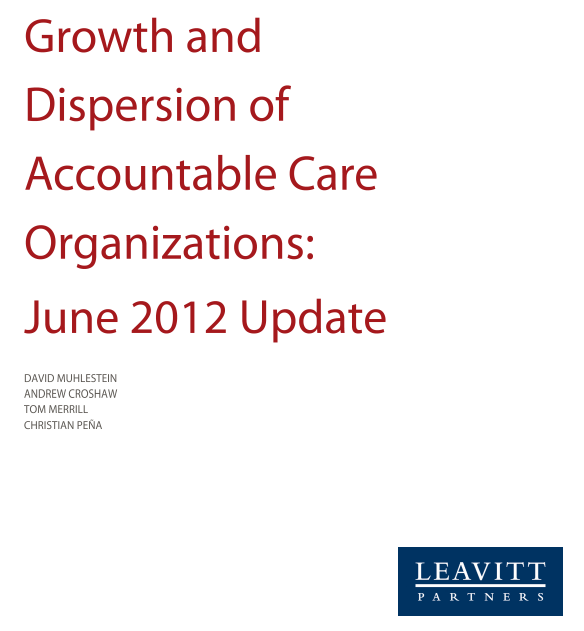 Leavitt Partners has utilized both public and private sources to track the activity of 221 accountable care organizations through the end of May 2012. Growth is concentrated in larger population centers though it has expanded to 45 different states. Care coordination and payment models continue to vary depending on the organization leading the initiative, the organizations involved in the ACO and the region or market in which the entity serves. While the various Medicare ACO programs seem to be influencing the direction of accountable care models, the government’s role in leading the growth of accountable care is unclear. Well said, though a clearly hedged future. I might add that irrespective of the outcome of the SCOTUS decision, the competitive ‘horse is out of the barn.’ As witnessed by United HealthGroup’s statement earlier this week of their intention to carry forward certain provisions of the Patient Protection and Affordable Care Act (ACA), if the decision is to deem the individual mandate (and perhaps more) unconstitutional. Irrespective of the legal shackles that may be placed on CMS, the commercial market is steaming forward implementing the very spirit of the Act via ACOs and derivative efforts to achieve the triple aim. All Eyes on SCOTUS Decision Expected Later This Week? Im wondering if the early gains (5%) aren’t just the low hanging fruit? How much savings can really be squeezed out before the trust between the physician and the patient is eroded?